East Coast Park is one of my favourite weekend hangouts and I love the feeling of cycling alongside the beach as I listen to the soothing waves and feel the calming breeze. Sometimes, I would visualize how awesome it would be to one day be able to go on a family cycling session and have my girls pedal their cute little bikes right beside me as we whizz down the paths. As a first step in making that dream come true, we bought Angel her first bicycle in Sweden when she was two years old. Without any prior knowledge and only making assumptions based on what we went through in our childhood, the hubby and I naturally thought a bicycle with training wheels was the best way to start. It was after some time that we came to realise that learning to cycle involves two main problems - the balancing problem and the pedaling problem. Training wheels solve the latter, which happens to be the easier problem of the two and with four wheels beneath you, it isn't that hard to focus on just pedaling. On the contrary, training wheels eliminate the need to balance, make you lean in the wrong direction, and most of all, they train you to ride only with training wheels. The moment you use the wrench to remove those wheels, the confidence and stability will vanish together. 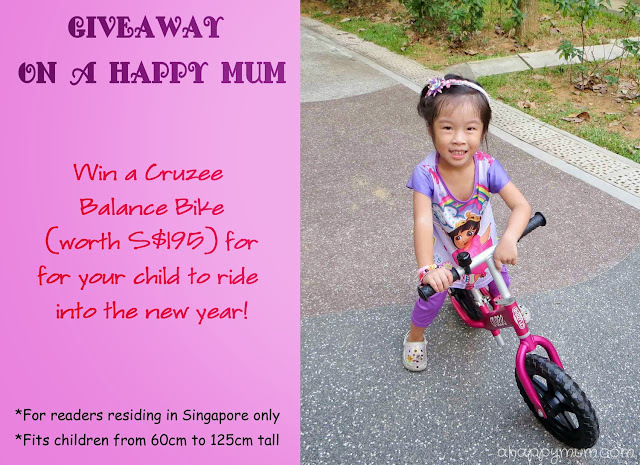 It becomes a whole new, somewhat terrifying, challenge for your child to learn to balance while he/she pedals. The first time I read about balance bikes, I was very much intrigued even though I have to admit that at first glance, a bike without pedals didn't really seem like the most useful thing on earth. It was after I read about testimonials and found out from friends that these are not merely fun, they are great tools to let young children develop their sense of coordination, build up their self confidence, and of course, learn the art of balancing with just two wheels. When Little Bike Shop offered to send over a Cruzee balance bike for Angel to try out, I was as ecstatic as a child who just mastered cycling and was cruising down the slopes for the first time or that amateur cyclist who just conquered coasting down the slopes of Haleakala, the world's largest dormant volcano. 1) It is ultra lightweight at 1.9kg. As the lightest balance bike in the market, that means even my girl can carry the bike herself! 2) It comes with an anodized finish in vivid, damage proof colours and will not fade, scratch, corrode, peel or rust. Which means your bike will look brand new 10 years down the road. 3) Adjustable seat and handlebar that can fit most children 1-6 years old and between 60cm to 125cm in height. No tool is required for this and you can make quick adjustments anytime, anywhere. 4) Padded seat for that extra comfort. Since I don't expect my girl to wear padded shorts like the professionals, I like the soft cushion which helps to make her feel more at ease. 5) The bike comes with two seat posts, one short and one extra long, which enables it to grow with your child. In fact, it can cater for a wide age range, making it easy for siblings to share or to pass on. 6) Stainless steel axle bolts with no protrusions. Unlike most bikes which use dome nuts that protrude from the axles, Cruzee uses button head cap screws so that your child can run along without hitting the ankles. 7) The bike comes in a selection of six brilliant colours – Blue, Red, Silver, Green, Pink & Black. Not hard to tell which is our favourite, right? As to how my girl fared, the first two times she tried the Cruzee, she was inevitably a little apprehensive because she had never been on anything that only had two wheels. I could tell that she was afraid of losing her balance and so she took cautious, small steps for fear of falling. With a little practice and encouragement, she amazed us the next time by running on the bike, then she lifted both feet off the floor before speeding past us. Yes, for the first time, I saw how my girl was finally learning to hold her balance, steer the handlebar, cruise around the park and most importantly, have fun in the journey. Though she is not fully there yet, my budding cyclist is now more adventurous, resolute and confident, thanks to the Cruzee and I can dare say it is a wiser choice to first learn to balance and then pedal, instead of pedaling before you can balance. Since Christmas is the season of giving, I am thrilled to have this awesome giveaway lined up as the final giveaway for the year 2013. 1) This giveaway is open to readers with a valid address in Singapore for delivery. 2) Please take part only if your child fits the height range. 3) Winner will be able to select colour based on availability. 4) The result will be announced on 1 Jan 2014 and the winner has three days to respond or a new winner will be picked. 1) Comment in this blog post below. Share with me your favourite place to go cycling and remember to leave your email address. 2) Click on the Rafflecopter widget to indicate that you have done 1) and to increase your chances of winning, follow the rest of the options. I am including a Instragram option for the first time so for those of you on it, do join in the fun! Disclosure: We received a complimentary Cruzee from Little Bike Shop for the purpose of writing this review. No monetary compensation was received and all opinions are our own. Our favourite place for cycling is East Coast Park! Only problem is that I don't know how to cycle, so we need to use a tandem bike. Heh. Just at our void deck! Cool! Our favourite cycling place is Pasir Ris beach. Fav place would be just down the block! Though would definitely love to take my boy and this cruzee places to explore cos this cruzee is light! kallang riverside park...near loysel's toy! n i love the pink! The sengkang park with the mushrooms cafe! It's not crowded at all! little park below my house. We like to cycle in the neighbourhood. Gardens by the Bay - lots of space for cycling & scooting! Cycle around the neighbourhood. tough to transport my big bicycle else. Pasir Ris park and around my neighbourhood. Yishun Park opp our new house! Back home in Singapore, definitely East Coast Beach! Over here the boys skate scooter down the UNSW walkway! Haha! My boy has not learnt to cycle yet. But it will be our void deck when he wants to learn how to cycle. Would love to bring my daughter there more often but too heavy to lug around a bicycle! we love east coast park for cycling! my email address is proof_bromide@yahoo.com.sg Thanks for organising this! This is so nice! We go to big open space in our estate. Definitely East Coast Park for an Eastie like me! Our favorite place to cycle is East Coast Park. We rent 2 adult bicycles with our boy(turning 3) seated in a child seat. East Coast Park, as that's where I first learnt to cycle when I was a kid! we love to cycle anywhere outdoors, but Punggol end is top on the list currently! It will be Bishan Park! Hope to win a cruzee for my daughter's upcoming birthday! Sengkang Riverside Park for us ! Thank you for hosting ! Hope to win one for Vera !